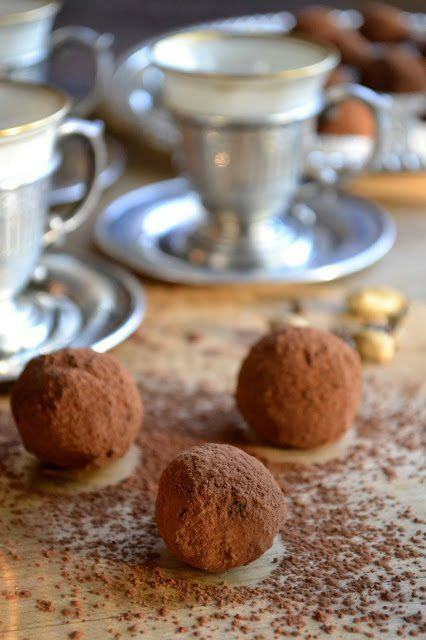 Easy Coffee and Cardamom Truffles ~ this easy homemade candy is a decadent combination of dark chocolate, cardamom, and coffee! Pour the cream into a small saucepan, along with the coffee powder and cardamom pods. Heat over medium heat, stirring to dissolve the coffee powder. When the cream almost reaches the simmer, turn off the heat and let it steep for 10 minutes. Bring the cream back up to a simmer, then pour the hot cream over the chocolate and let it sit for 10 minutes. Stir the chocolate cream mixture to completely melt the chocolate. Keep stirring until you have a smooth glossy mixture. If there are still any lumps of chocolate, you can microwave the mix for about 10 seconds. Pour the ganache into a shallow pan, like a pie plate. No need to spread it out. Cover with plastic wrap and refrigerate until the ganache is firm enough to scoop, this will take about an hour to an hour and a half. Remove from the refrigerator and, using a small 1" scoop, melon baller, or a teaspoon, scoop small portions of the ganache and roll between your palms to form a smooth round ball. Set the balls on a plate while you finish the rest. Don't worry if you can't get the truffles perfectly round---the candy is named after the rare underground mushrooms that are famously misshapen! Roll the truffles in the cocoa powder to completely and evenly coat them. Store in the refrigerator, or at room temperature.